Hubby has finally begun the Rhodies coop addition roof. We are super serious about building a completely “safe from predators” chicken coop. That’s why coop number two is taking us so long to complete. 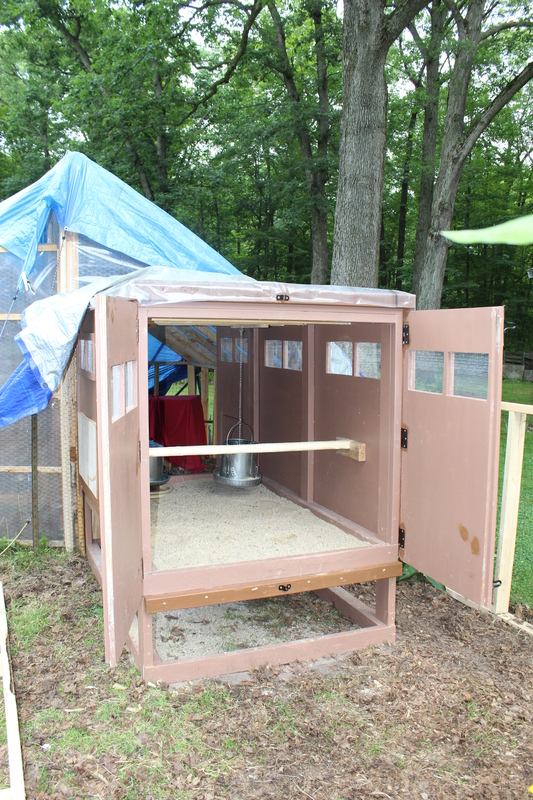 This is the 4 ft. X 8 ft. permanent coop home for our Rhode Island Red pullets. Our chickens coop is definitely secure enough for them to sleep in right now but it still needs its corrugated plastic roof, hardware cloth on the bottom for winter dusting, two chicken ladders, window shutters and nest box. We are getting a bit closer every day. These remaining parts are built and painted but await installation. We are focusing now on getting the roof done next because we have plenty of time before autumn when we will need the window shutters. Likewise we have a few months yet until the pullets begin to lay and we will need the nest box attached. Our primary focus now is on building the roof truss support and then adding the corrugated white plastic roofing material. We intend to match the roofline of the covered run so this is a detailed endeavor. After this roof is completed the temporary blue tarp will be removed. The tarp will eventually become just a rainy season cover. A coop this detailed take a long time to build right. My husband is not a carpenter just a good guy trying to make his chicken keeper wife happy. I love using sand as coop litter. It clean up easily and stays cool. Hardware cloth and screwed-in frames makes these windows safe and secure. 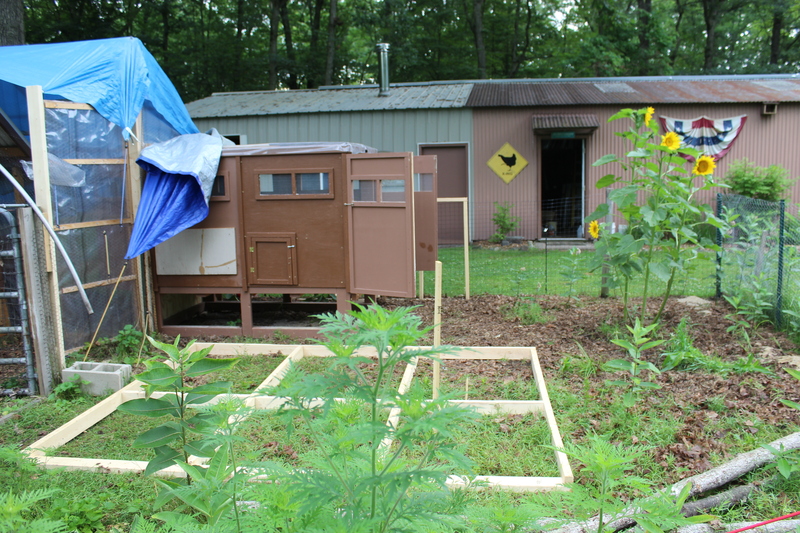 The 2 X 4 wood frame lying on the ground is the east side wall of the new enclosed pen. This will be positioned against the existing fence and a roof truss will be fitted over it. The roof will hang over to make a narrow run area for outside winter activities. 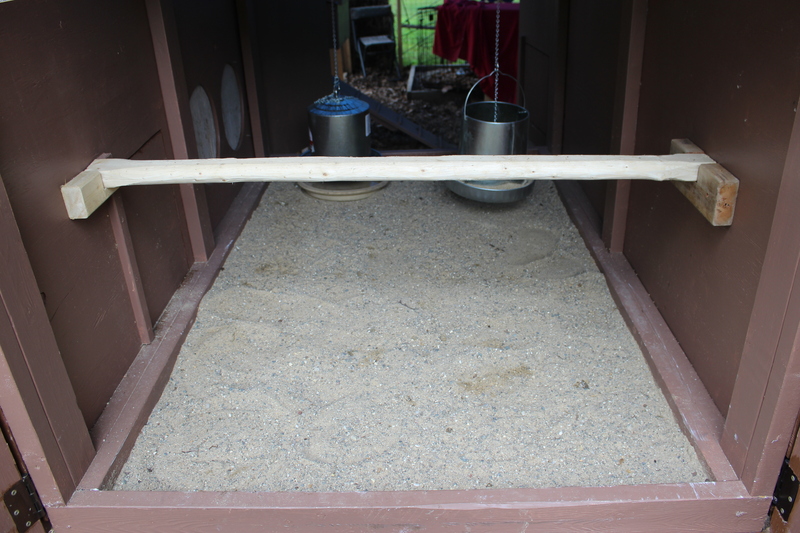 It will also funnel the rainwater off it to run into the grassy area and not into the run itself. This gives the pullets an option of their own small run since our Cochins have not taken well to the new pullets yet and continually chase them out of their coop and run area. They no longer peck them but just let them know that they are not welcome to hang out with the big girls. 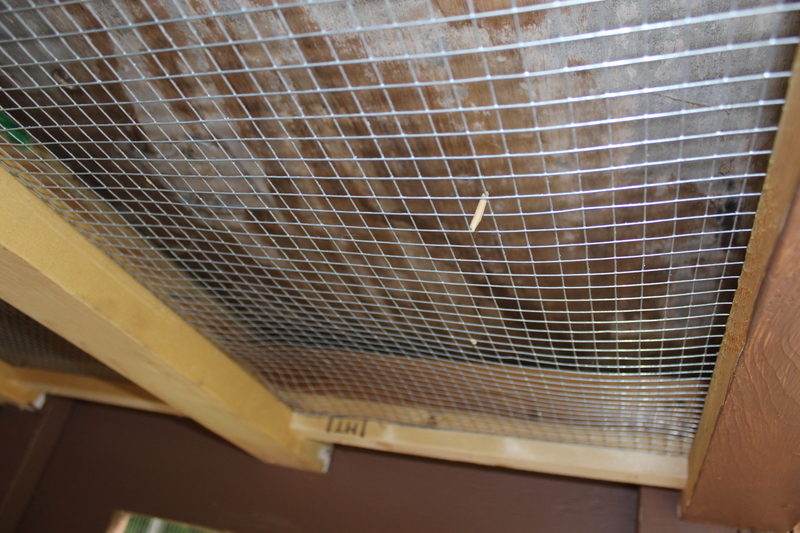 Hardware cloth on the ceiling of the coop also make for a secure from critter home and adds extra ventilation too. Once the white corrugated roofing material is in place this hardware cloth will allow for upper ventilation. This construction technique really made a huge difference in the coolness of coop one. 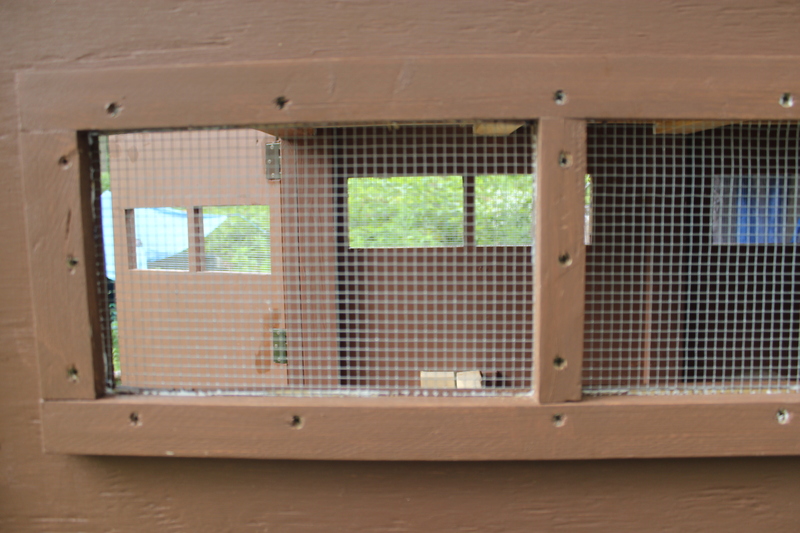 In this photograph you can see that this coop can be cleaned out thru its double doors from either side of the coop, north or south. I will be able to access the coop inside from the outside run area during the spring/summer/fall months or from inside the covered run area during the 6-month-long Michigan winter. it is common to have 6 to 8 feet of snow here so we are thinking ahead. 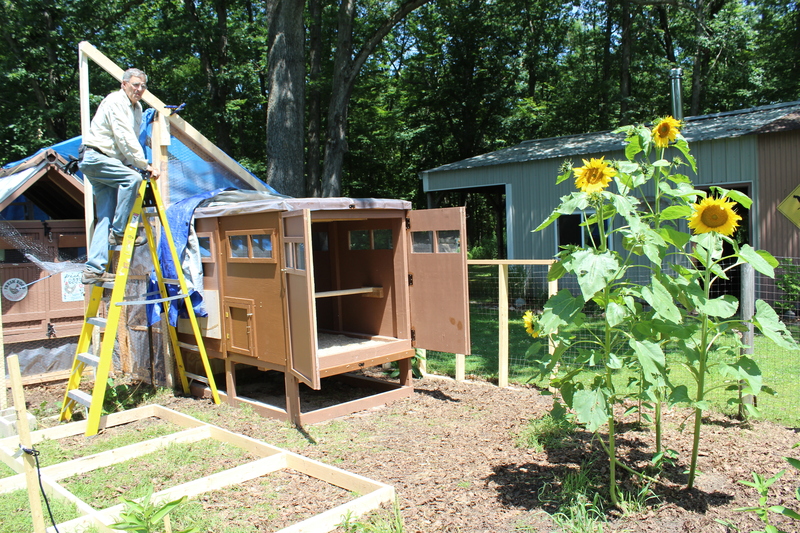 We have learned a few important things from the last time we built a chicken coop and added those ideas to this one. And we are taking the time necessary to build this coop right. More to come! P.S. The broody girls are starting to lay eggs again at last. We are now getting on to two eggs a day. it’s a good thing as we have been having to buy them! !